A job well done requires tradition - cohesion - integrity�three things that are at the foundation of who we are and the reason why so many people choose us to build their dream. 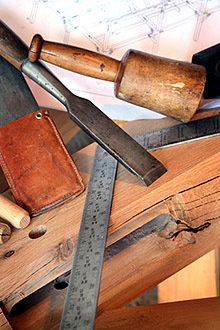 As craftsmen, we adhere to the joinery techniques used by builders for hundreds of years, insisting on a high level of craftsmanship. Our skill set, however, also includes the latest Computer Numerical Control (CNC) technology, which provides an added level of precision and efficiency to our highly skilled timber frames. Having framers skilled, both in the age-old joinery, as well as, the CNC technology, allows us to review your plans and determine the most appropriate technology to keep your vision within your timeframe and your budget. As timber framers, we have a shared love with our ancestors for wood structures that date back hundreds of years. Through the centuries wood has proven to be a durable building material, ensuring that the structure we build for you today will be here for generations to come. As a natural, recyclable and renewable building resource, we know we not only build beautiful, longstanding structures, but structures that make the most sense for our environment, too. From day one, you will have a South County Post & Beam team dedicated to making your dream home a reality. We strive to keep our process seamless - so the hands cutting your frame will also be the ones that erect it. Our standards for communication are designed to keep you informed, from initial planning to housewarming. Your love for the design, the materials and the workmanship will be grounded in a working relationship that's rock solid. That's why returning phone calls, keeping promises and respecting deadlines is how we choose to do business. We look forward to proving it to you.